As an Account Manager primary administrator, you can edit your profile information, such as name, password, time zone, and communication preferences. Click Edit My Profile at the top of the window. Enter your First Name, Last Name, New Password, and Confirm New Password. Hover over to learn the password requirements. Enter the Federation ID if you are using SAML account. 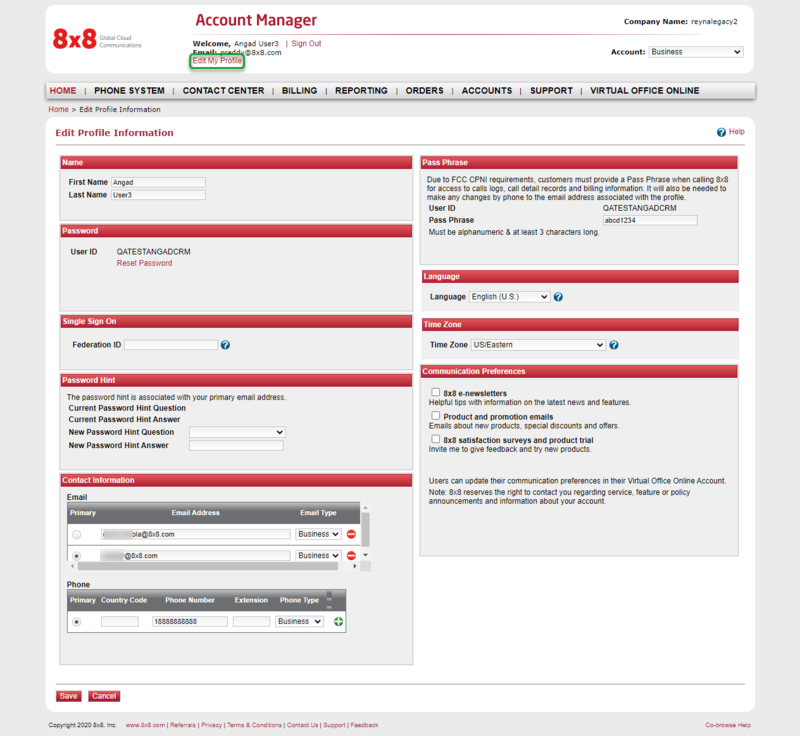 The Federation ID is used to map the SAML identity provider account to your 8x8 account. Enter both New Password Hint Question and New Password Hint Answer. The password hint is associated with your primary email address. Enter your primary email address and phone number. You need to provide a pass phrase when calling 8x8 to make changes to your email address associated with the profile. It determines the language of the email communications sent to the primary administrator such as password reset or account notifications. The time zone is used for call recording, call queues, and scheduling and running reports. Enter your Communication Preferences, such as newsletters, product and promotion emails, bill notifications, and surveys. You can also update your communication preferences in your Virtual Office desktop app. Note: Only the primary administrator is able to receive billing notification emails. Secondary administrators (even those with billing privileges) do not have the option to receive billing notifications.